For 40 years now, tuba and euphonium players from all across Vancouver Island and beyond have been gathering at Market Square in downtown Victoria for one of the city’s most anticipated holiday traditions. 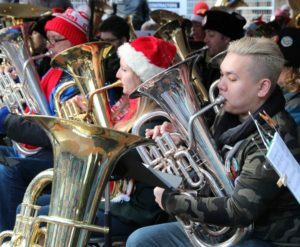 TubaChristmas returns to once again raise money for the Times Colonist Christmas Fund, a charity that assists the people most in need in the Greater-Victoria community. TubaChristmas, as performed by the Victoria TubaChristmas Ensemble, runs from 1-3pm Saturday, Dec. 8, in Market Square, 560 Johnson Street. Donations will be accepted throughout the duration of the event. Last year, an impressive 101 brass musicians gathered to play an afternoon of favourite carols, and the resulting donations far exceeded those collected in previous years. Tubist and UVic instructor Paul Beauchesne — who will lead the ensemble for the fourth year — has his sights on record-breaking numbers for the 40th anniversary of this beloved event. And this year, local video production company Roll.Focus and CHEK TV are partnering to produce the first livestream of the event. Beauchesne describes the sound of massed tubas and euphoniums as a “sonic hug,” filling the square with music that will echo through the surrounding streets. 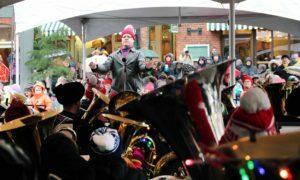 Jointly sponsored by Market Square and UVic’s School of Music, TubaChristmas was established in Victoria by the much-loved tubist, Eugene Dowling, who succumbed to cancer in June 2015. Dowling was one of Beauchesne’s tuba instructors, as well as a mentor and friend, and Beauchesne is proud to carry forward the TubaChristmas torch. TubaChristmas dates back to 1974 where it originated in New York City by the late Harvey Phillips of Indiana University. Concerts now take place in over 200 cities worldwide and this year marks the 45th year for TubaChristmas internationally. The original concept was to honour the late William Bell (1902-1971) — Phillips’ teacher and former tubist with the New York Philharmonic — who was born on Christmas Day, but over the decades it has grown to become so much more. Don’t miss this once-a-year occurance, which has grown into one of Victoria’s most beloved seasonal events!